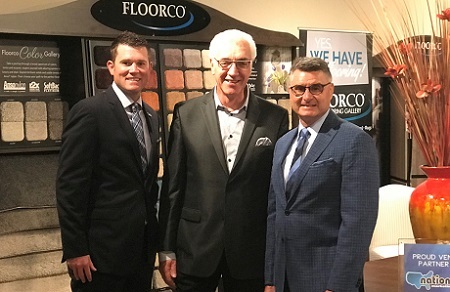 Jeff Rose, left, Nationwide Marketing Group; Ron Dunn, Alliance Flooring, and Jerry Honea, Nationwide Marketing Group, in front of the new Floorco display in Nationwide's World Market Center showroom. LAS VEGAS — Nationwide Marketing Group has partnered with Alliance Flooring, a resource group for independent floor covering retailers, and is now offering members private label flooring products. The announcement at the Las Vegas Market to the furniture, appliance and electronics buying group members was paired with the installation of a flooring showcase in Nationwide’s showroom here, B-826. A visit will allow retailers “to hear how they can better serve their local customers, especially new homeowners or those remodeling their current home,” the buying group said. Through the relationship, Nationwide will have a brand of flooring products under the name Floorco exclusive to Nationwide members, featuring product from suppliers such as Shaw, Mohawk, Dal-Tile among others. Alliance Flooring’s Carpets Plus/ColorTile members will stay with their existing branding approach. However, eventually, Alliance and Nationwide will work together to utilize and co-develop assets to support the Carpets Plus/ColorTile members, too, said John Laing, Nationwide’s director of new business development. “So there’s two pathways of the partnership — taking advantage of expertise, scale and decades of independent retail knowledge coming together to build sustainable solutions for (Alliance) and NMG members,” he said. Nationwide is encouraging retailers to stop by its showroom to learn more about the program or attendance at its PrimeTime Convention and Buying Show, Aug. 5-9, in Las Vegas. Retailers can meet with Ron Dunn, president of Alliance Flooring, and attend sessions about the partnership that are being led by Dunn and Nationwide’s leadership team.